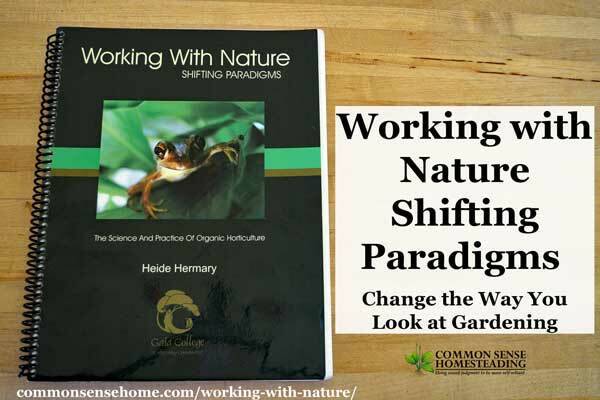 Working with Nature – Shifting Paradigms: The Science and Practice of Organic Horticulture was one of those books that had me jumping up and saying to my husband and boys, “Look at this!” The author, Heide Hermary, opened my gardening world to a whole new range of ideas and possibilities. How is Working with Nature – Shifting Paradigms Organized? Contamination of our food supply with GMOs (genetically modified organisms) and chemical toxins. A food supply that is lower in essential nutrients. We are starving in a land of plenty. She suggest that we start asking new questions instead of simply attempting to fund new solutions for the old questions. If we care for the land, the land will provide for us. It's a win/win. The book contains over 200 pages densely packed with information, plus a bulging reference list for further investigation (there's literally a lifetime of investigation waiting for you here). I'd like to share some of the ideas that caught my attention. In chapter 1, Heide discusses Trade Alliances, that is, alliances between organisms that benefit both parties involved. Most of us are familiar with the pollinator/plant relationship, but I think many of us are unfamiliar with microbe and soil allies. She shares that all plant leaf surfaces are “naturally colonized by a great diversity of microbes that feed on the metabolic wastes excreted by plants”. These microbes, in return, protect the plant from diseases, insects and possibly airborne pollution. Inoculating a plant with compost tea has been shown to protect a plant from aggressive plant damaging fungi. Have issues with downy mildew or blight? Compost tea and Effective Microorganisms may be your answer. Have you ever heard of mycorrhizal fungi? Oddly enough, I first saw the term “mycorrhiza” years ago in a fantasy novel – “The Dragonriders of Pern”. In that series, they adapted naturally occurring plant protectors found in the soil to protect and heal plants from an extra-terrestrial attack. 🙂 In our world, mycorrhizal fungi colonize plant roots. They then send out hyphae (branching filaments) into the soil (potentially miles of filaments) to gather nutrients from the soil that the plants have difficulty obtaining on their own. They trade these nutrients to the plants for carbohydrates. Pretty cool, huh? These fungi also acts to protect the plant roots. They repel bacteria that would consume the roots. In fact, soil dwelling fungi have been used to develop commercial antibiotics. Basically, there is an entire ecosystem in miniature associated with every single plant. The healthier and more robust this ecosystem is, the more likely your plants are to thrive. Any time you disrupt this ecosystem – via tilling, applying chemicals (even fertilizers – many synthetic fertilizers are toxic to microbes) or introducing GMOs – you damage this ecosystem. Conversely, with the reintroduction of helpful microorganisms (such as the application of compost tea), badly damaged “worn out” soil can be healed. Another intriguing concept addressed in the book was biological transmutation. Heide describes how living organisms (animals, plant and microbes) can transform certain isotopes of some elements into specific isotopes of other elements. (Yes, some animals, plants and microbes have mastered alchemy.) This is relevant to gardening because it appears that within an ecosystem, certain plants don't simply grown well together as companions, they do so by providing for the needs of the system by transmuting the very elements available in the soil. I could go on and on – from debunking the myth that blueberries need acidic soil (they really just need the nutrients that are often available in such soils – pg 146), to pointing out the problems with drip irrigation (how can you have a healthy, diverse ecosystem in a soil that's starved for water? pg 82) to working with energy in the garden (chapter 7 – somewhat “out there” for many, but if you read it a lot of it just makes sense) – this book is a wealth of information. It's like no other gardening book I have ever read. 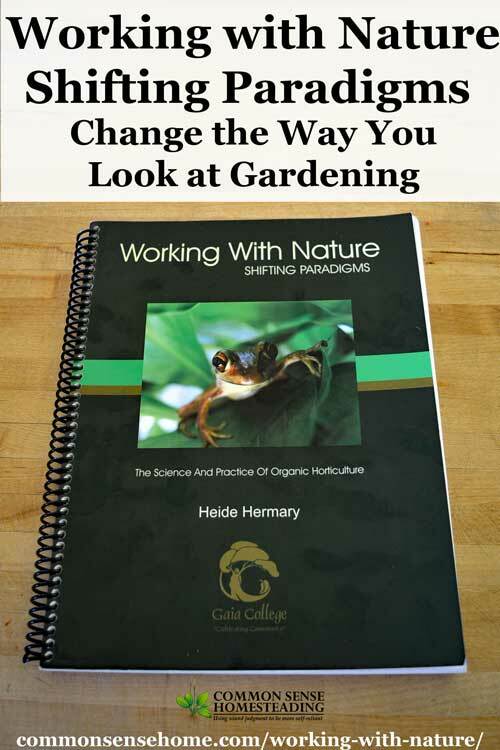 Along with Working with Nature – Shifting Paradigms, Heide has also written a book titled The Essence of Organic Gardening: Seeing and Doing Things Differently. 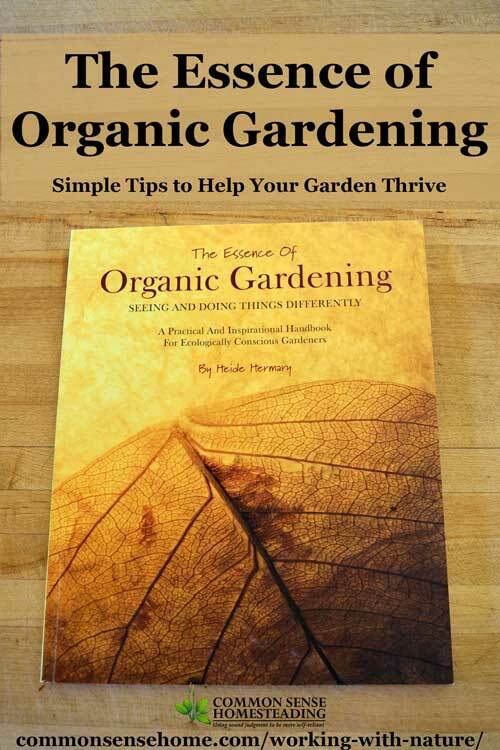 This 43 page book is a great introduction to organic gardening, explaining to the reader the basics of what defines a healthy garden, and simple tips for making your garden thrive. This book would be a wonderfully quick and easy read for those new to gardening, or those who have been gardening for a while using mainstream gardening tactics. We shouldn't be fighting nature, we should be working with nature. In many ways, we have acted like curious toddlers, wandering into our environment and making changes with having any true understanding of the long term and widespread effects of our efforts. These books are part of a slowly growing movement to work with the earth instead of simply bending it to our will. It is long overdue, and I believe we will all be the better for it. In Remembrance of Heide Hermary 1948-2016. Heide was president of Gaia College in British Columbia, Canada until her passing in 2016. Gaia college offers a variety of classroom and online programs. Heide held a Masters Degree in Sustainable Agriculture and a Diploma in Landscape Design, Maintenance and Installation. In 2007 she received the Educator of the Year Award from the B.C. Landscape and Nursery Association. She was also the co-founder of the Society for Organic Urban Land Care. I haven’t been gardening long (2 yrs), and have 3 girls who love being in the garden with me. I love this time, because we get to learn together how plant grows and reap the benefits of growing our own food. They absolutely love the fruits and veggies we grow as oppose to store bought. Once the plants start to bear fruit the kids are always out there eating right off the plant. This year we have new plants; nectarines, blueberries, and raspberries. I have a greenhouse and was wondering what is the coolest temperature it could reach without hurting my seedlings? This is my third year of Organic gardening and every year is more exciting, more information to help me. I’ve had good crops and some not so good, but love every minute. I’m planning on expanding my garden and to try my own compost. I would love to win to continue learning. I am interested in companion gardening and specifically in organic gardening efficiently in small spaces. I’ve been interested in aeroponics and aquaponics as ways of growing in vertical spaces. What a wonderful book. Thank you for the opportunity and for the information on your blog. Matter in the soil to process. No worms no top soil, no top soil no food. Healthy plants are not as affected by pests as are sicklly ones. It only makes sense. Healthy food needs healthy conditions, it cant give nutrients to the food when there is none to put in it. We are a symbiotic planet, we need to work together for the good of all. Looks like a wonderful book! We are starting a sustainable garden in hopes of selling produce at farmer markets. This would help immensely. Great review and a definitely a tool I can use – Not only to better my own working knowledge but argue more effectively in favor of my hobby/obsession! I don’t have much experience with gardening, but I am just about to move out of an apartment and into a house with a nice empty yard (no grass or anything) and a lovely hill covered with vines and brambles. I’m very excited to start planting! This looks like such a fascinating book! I’ve got it wishlisted on Amazon now, but I must say I’m hoping to win it- our garden is getting bigger and better every year and I want to learn all I can about it! I have been gardening all of my life and I still can never wait until it is time to garden every spring again!! What a timely post! I am always amazed at how God created our Earth to handle so many of its own issues if we will just get out of the way! Hi Delores from Central Valley, Ca.! I also live here and have been growing foods organically for some time. These books have some refreshing new ideas I’d like to find out about. I have read about certain plants with the long taproots and the seasonal planting just for the purpose of tilling in nitrogen each year. Each new idea just adds to leaving the earth better than how we find it. Our family is working hard to get our good sized backyard turned into a productive garden but we all have brown thumbs. Wondering if you could tell the best tips you have for “folks like us”. These sounds like great books. I think many of us are ready for a shift into a truly sustainable culture and the way we treat the land that provides us our food is an important place to start. Glad you stumbled across this Laurie – I can vouch that it’s a fantastic book. Good review, too. I am very concerned about the rampant and irresponsible use of GMO’s. I have posted on my timeline as much info as I can find and wish there were more people paying attention to what is going on. We are worried about weight in our children as we stuff them full of alien foods filled with hormones and heaven knows (or doesn’t know because it wasn’t suppose to be this way) what has been done to foods designed to feed our bodies well. Thank you for spreading the word. I’m new to gardening and am loving it. I would love to learn more about it. I am so excited about learning more about organic horticulture…I have more than ONE question and would LOVE to win this book. Would love to get this book for ideas!!! I have tried organic gardening but have a lot of trouble with bugs. I don’t know if it because I live in Florida or what. I am trying different things to improve my soil and this book would be a great help! How awesome! This looks like just what I need! How can I keep fire ants out of my garden without using horrible chemicals? Those little buggers are mean! Growing organic food is a priority for me! I’ve had lovely gardens in the past, but it’s been long enough that I fell like I’m learning everything for the first time. I’m looking forward to getting started this April! When should one start planting seeds? I have been learning about moon cycles and planting and I would love to learn more about natural cycles in gardening. Sounds like a wonderful book and much needed tool for a healthy environment. We live in Southern CA and our soil is plagued with root node nematodes. They infest the roots of the plants and then the plant cannot thrive because the nutrients are blocked at root level. I have read that introducing fungi to the soil will help balance the “good” nematodes with the “bad” nematodes, creating a healthier soil for the vegetable garden. I’m looking forward to the author’s answers to creating a more friendly enviroment for my veggies. We finally moved out of the city!!!! And now I have an acre and a half to garden in. I’ve got so much ahead of me that I don’t even know what to ask or really where to start. I’ll be working with the garden area they had established for this year and working towards having many, many more areas ready to garden next year as well as figuring out the best way for us to have chickens and adding to the young orchard here. SO excited and totally overwhelmed! This would be a great resource. Our yard has lots of potential–plenty of sunshine and space. We are on year 2 of our organic program, and I’d love this resource! I would like to know more about mycorrhizal fungi and the science involved in healthy soil. So need help with composting. Thanks for the opportunity. I am constantly trying to learn more about successful gardening and good stewardship of land. These books sound like they would be invaluable resources. I’m interested in the concepts around companion gardening. Removed 2 years ago to a home with a very established perennial garden taking up much of the backyard. I am currently scaling some of it back to include vegetables and herbs. It is a challenge! Whats the best way to propagate elderberries? Those look like great books! Is Working With Nature about permaculture? We use Llama beans for fertilizer….2 llamas….lots of poop! I haven’t had a garden in years and years but this year I have a plan and a place to put in a new garden! I eat so many ‘greens’ that it just makes more sense to grow my own. And I have seeds of many different varieties that I can’t get at the grocery store! Can’t wait! This book sounds fantastic, just what I need! I just bought my own house, so am just getting started with a garden this year. I would like to be able to work with the soil, plants, insects and ecosystem in the most beneficial and synergistic ways. I started canning again last year (last time I did that was in 1983) and I am planning on a garden this year. My brother works for Dow Chemical and had brain washed me saying that big ag was needed to feed the world and that the chemicals and big ag processes are not detrimental to our environment. I have been learning so much about homesteading, organic gardening, the environment, etc. in the last five years since he and I no longer speak, and thanks to the internet. So many things I am learning that I was censored from while married to a man that is good friends with my brother. Been gardening for three years and I am still experimenting with better ideas to maximize my garden and ecological gardens. Could use a couple books like this. Looking to start gardening this year. What are the plants that thrive the best in containers? I live in a townhouse and don’t have a “yard” to garden in so I’m limited to containers. I’ve got potatoes growing right now but I wasn’t sure what else would do well. I really enjoy your blog and website. I am learning a lot and increasing my skills. Your last post [Working with Nature – Shifting Paradigms Book Review] was freaking awesome. I have gone ahead and added your stuff to my Feedly account. Please keep me updated if you post anywhere else.